On Sale £37.00 - all incl (No hidden extras). 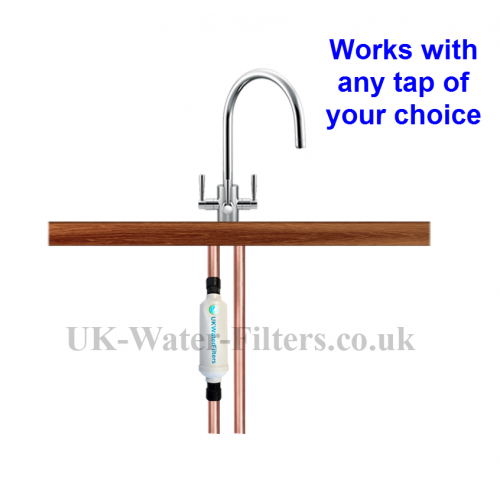 Get your filtered water delivered via your existing kitchen sink cold water tap - instead of having the usual extra small tap that is required with most undersink water filters. The filter sits out of sight, under your sink, and is quickly and easily placed "in-line" on your cold water pipe. 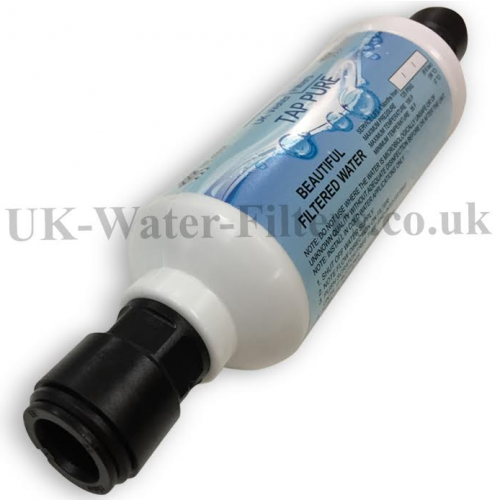 Your filter contains powerful Granular Activated Carbon to give you very high quality filtered water. It greatly improves the taste of your water by removing virtually all chlorine and many other chemicals that affect the taste and quality of your drinking water. Not only do you get a simple practical solution for your filtered water needs but the special carbon filtration media also gives you the sweetest tasting water possible. 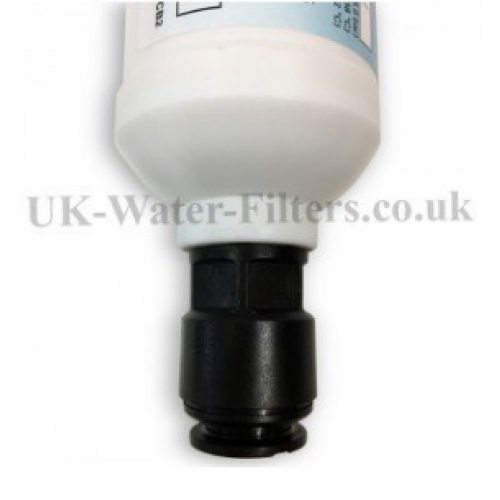 The filter works by using fully proven Granular Activated Carbon. How long does the filter last for? The filter needs to be changed every 6 months. What happens when it's time to Renew? You simply buy a new one and replace it for the old one. You can claim a £5 discount as a loyalty bonus. (Sorry it can't be more but these are high quality filters that cost us a lot to make). How much does it cost long term? £32 every 6 months will cost £5.30 a month or 17 pence per day. Plus; it is much better for the environment! You simply cut your cold water copper pipe and place the filter into the gap - so that it sits "in-line". This is a job that can be done fairly quickly by a DIY enthusiast. 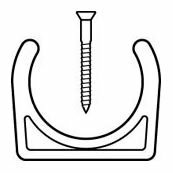 All you need is a 15mm pipe cutter - which you can easily get from any High Street hardware store like B&Q. Or it is a very simple job for a plumber. When it comes to changing the filter - every 6 months - you will be able to quickly remove the filter by manipulating the easy push fit fittings at either end. (This is really easy to do. It will take you one or two minutes). Includes free bracket clip (usual price £4.95) to secure your new filter to the wall. Simple to fit (15mm push fit ends). The filter can fit in line into your copper or plastic flexible water supply pipe. Plumber or reasonably good DIY person required for FIRST fitting only. Replacement filters can be fitted by yourself. This will take 2 minutes max. Filter lasts for 6 months before replacement. We send you free reminders when it is time to change. The filter replaces itself, i.e. you take out the old one and replace it for an identical filter. If you have a particular problem contaminant to remove which is not mentioned above please contact us for confirmation. This is one of our top sellers. That's not surprising given what it offers you: Beautiful tasting, purified water from your existing cold water tap. No more overpriced plastic bottles. Get healthy water for you and your family on tap whenever you like. This is a job that can be done by a DIY enthusiast - a pipe cutter will be needed - or it is a very simple job for a plumber. (This is really easy. But to be sure you can do it, get your fitter to show you how - and quickly try it yourself - before they leave). Don't worry we're here to help you with any questions! Water pressure is hardly affected - only expect a pressure loss of 4% max. 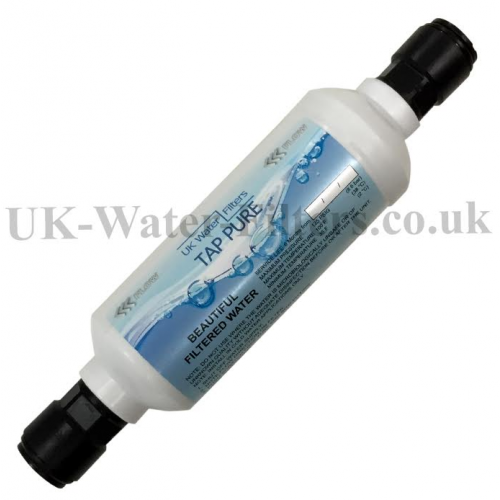 The Keep your Own Tap filter should give a healthy flow rate of up to 15L / minute. There won't be a noticeable difference in the flow rate you're already getting with your existing cold water tap. Expect a loss of 4% at most. 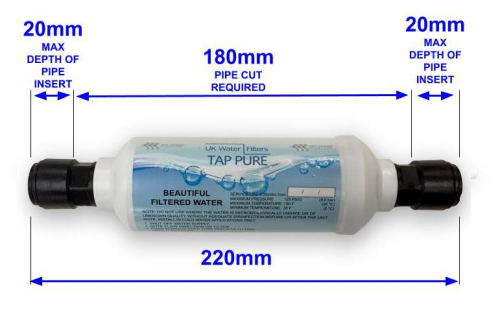 To connect the Keep Your Existing Tap filter to flexi hose with female connections you will just need 2 x 3/8" to 15mm compression fitting adapters to screw into your flexi hose with female connections and two pieces of 15mm copper / plastic pipe to fit into the filter either end. About 70mm of pipe is needed for either end then just reconnect to the flexible pipe compression fittings. So glad I found this company - they are ‘old school’. Committed, diligent, polite and knowledgeable, nothing is ever too much trouble, and you are reminded when the filter needs changing I. Order to keep your water safe and clean. Keep my tap is brilliant!!! 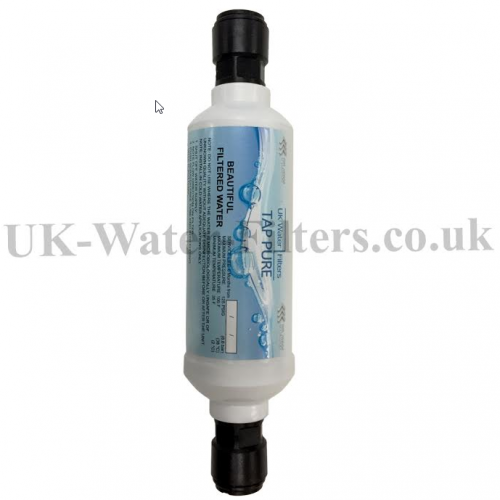 Excellent quality of service from UK Water Filters in providing a product that is very effective. 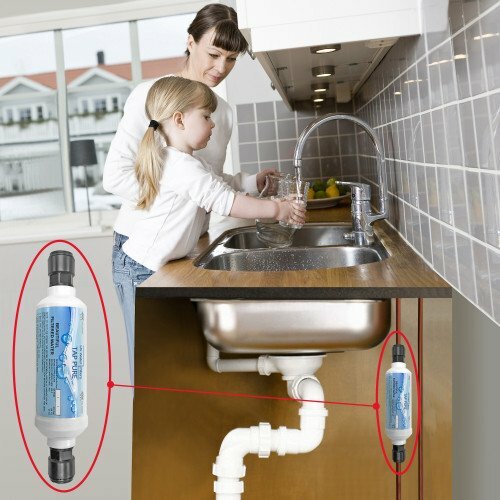 Their easy to install water filters have changed the quality of water from the fairly unpalatable to that which the whole family now can enjoy straight from the tap. Goodbye chlorine smell and aftertaste - and no more wasteful plastic bottles! 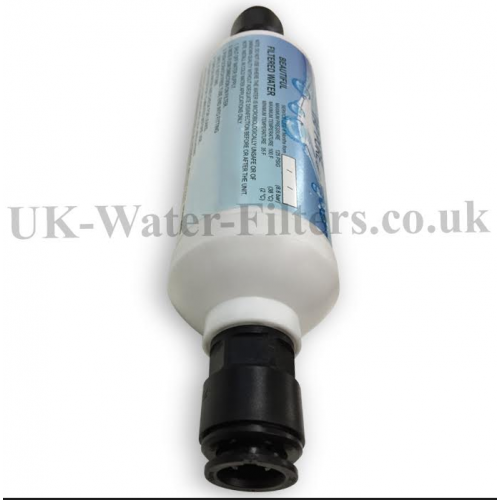 UK Water Filters are excellent to deal with. They make ordering replacement water filters as simple as possible through their reminder service every six months. We've had no trouble with delivery or installation of our replacement filters, as within 1-2 business days they arrive and are easy to fit. They are very pleasant to deal with also with very friendly staff. 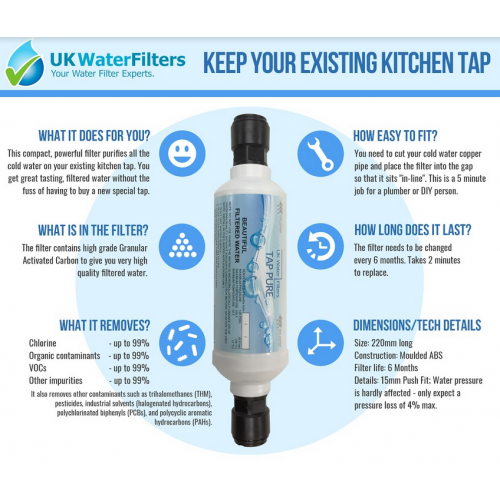 I would highly recommend fitting a UK Water Filters product. I ordered my first water filter a couple of years ago, only got the one to try because the water in this area is very hard. After about a week and a half the difference was obvious, less lime scale to keep under control and a better taste to a glass of water. So I then ordered a 3 pack to save on costs, I change my filter on the 22/6 also 22/12, which aloud me to order without any problems with timing. I also added 2 small in line valves, one just in front of filter and one just the other side, this cuts water mess when changing to the minimum. Service from the company, easy five star, any questions delt with swiftly and replys asap! I even got a thank you for returning some unused paperwork and lables I have no use for. As long as I don't get bombarded with phone calls I will be pleased to answer anything I can. Product arrived quickly and well packaged. I loved the use of a recycled box instead of bubble wrap. A nice touch given the current plastic crisis. I fitted it myself in an hour or so but I took my time to make sure all my measurements were correct. I'd describe myself as a 'have a go' DIYer in that I am no expert but if a job seems straightforward and doesn't require certification, I'll have a go. This job was simple. I turned off the water, cut the pipe, cleaned the ends with steel wool and fitted the filter according to the instructions and it held fast. The water from it is now much more pleasant to drink. I live in a soft water area so it wasn't too bad before but I know it's been through a chemical process and miles of pipe before reaching me so I wanted to make sure anything remaining from that process was removed. I will be reordering in 6 months for sure. We have had a new kitchen fitted so decided to have a water filter as have bought bottled water for years Tried a Jug Filter which cost a fortune also. This has changed the taste of the water immediately No Chlorine for sure as that is what I bought the bottles for It was like drinking water from the swimming baths. Excellent !! Arrived the next day, easy installation and works perfectly. The best follow-up service never seen! Nice people, nice business, nice products. The main reason for installing the filter was to do away with (or at least drastically reduce) our use of plastic bottles. We go through at least 20 litres of sparkling water and 10 litres of still mineral water a week and all in plastic bottles. We also bought a water carbonator so now we have endless still and sparkling water. The cost for the soda charger is about the same /L for a bottle of sparkling water but the still water is free now that we have a filter. More importantly, no more plastic bottles and we feel better for it. we received the new filter and my husband has fitted it. We returned our old one in the post as requested. Thank you so much for your quick , efficient service. we received the new filter and my husband has fitted it. We returned our old one in the post as requested. Thank you so much fo your quick , efficient service. I fitted the filter the same day it came and was over joyed with the ease it fitted into the plumbing. Although i did fit 2 shut off valves, 1 just before the filter ( water in)and the other just behind (water out). This cuts the amount of water mess when changing the filter ( I hope). The filter'd water is so nice and fresh to taste, we now make our tea with it. With an added bonus that the kettle does not furr up any where near as much. So all in all? SUPERB BIT OF KIT. we bought this to fit in our holiday home in Spain as water had a horrible taste to it and looked white in colour. After fitting and running tape for few minutes water became clear and the tasted fine. Excellent service and delivery was very prompt. Installation was a breeze and I am now enjoying great tasting tap water. The only question I have is why did I not do this sooner. I didn't waste any time installing my new filter. I was very sceptical it would even work at first. It took three days approximately for the filter to positively affect the quality and taste of my hard water. I am now absolutely loving it! My wife always bought bottled water and hated the tap water. She too loves it. I will be buying at least one more for the bathroom. Just had this fitted in my new kitchen and it is great. I can now safely make my tea or have a drink of water safe in the knowledge that the the water will not taste like a swimming pool. Wish I had found this product earlier. Great filter, really straightforward to use. I've been buying for 18 months and a reminder email every 6 months is really helpful with a link straight to the correct filter. Always arrives quickly and well packaged and option now to return old filter as well. Filter is fitted and yes the water and tea taste's great. Fitted in ten minutes, all push fit fittings except the isolation valve. Hard to improve your product and service. I'll be back. Water filter is working really well. This is the second one that I have fitted and the quality of the water has been vastly improved. Every household should have one fitted. My family, friends and myself have used this filter for many years and none of us would be without one. My son and daughter allowed me to fit them both one (which is very easy and I am a woman!) when their children were babies so they had 'clean' water for their feeds. The trend has continued and as already stated, would never be without one. Every home should have one! We are delighted with our filter and no longer need to buy bottled water due the bad taste. We highly recommend this system, fast delivery and easy to install. I have fitted the filter and it is working perfectly. Thank you for the speedy service that you dispatched my filter and also thank you for the excellent follow up that you have given. Your customer service is excellent. I will recommend you to family and friends and will use you again when my filters life has expired. Thanks again, Mrs Mandy S.
Hi our water filter arrived last week and was installed last Friday. It is fantastic and we would recommend you and your company every time.